There was something eerie in the air as the tumbrils passed through the streets of Paris that led to Place du Trône Renversé. It was, in fact, too eerie that the normally noisy and violent crowd was "in a respectful silence such as has never been accorded throughout the Revolution." No rotten fruit was pelted and no clamorous insult was raised on the condemned women and men. That evening one only heard the ethereal chanting of sixteen Discalced Carmelite nuns on their way to death. < face="Arial" size="3" color="#5E0000"> These women could hardly be recognized as nuns. Wrapped in their white mantles, they did not, however, wear their veils. Their wimples had been cut away, exposing their necks to facilitate the truculent job of the guillotine's blade.
. The glorious company of apostles praises you. Many historians agree that the twentieth century traces its foundations to the events that shook France from 1789 to, strictly speaking, 1795. The French Revolution took place amid an in social disarray. Historian Edward Tannenbaum capsulized: Many people knew that something was wrong. There was an economic crisis aggravated by population pressure; the aristocratic resurgence exasperated sections of the bourgeoisie and the peasantry; enlightened political ideas were raising constitutional issues, and enlightened despotism was not working very well. The clash, however, of the old and new orders produced a violent friction. Reforms were plenty, indeed, but violence also abounded, caused by years of bottled hatred or plain paranoia. Soon, freedoms highly idealized by the revolution like choice, conscience and religion were trampled upon. There were too many victims in the process, many of whom were commoners exercising their democratic rights. Among them were the sixteen Carmelites of Compiègne. The nuns came from every social stratum of French society and each had her unique personality.Taken as a whole, the community does not present an exceptional milieu. Their fathers were a master purse-maker, shoemaker, turner, laborer, clerk, and an employee of the observatory. Only one is a counselor of the king, one a noble squire. Few were blue-blooded; most were commoners. The grille sheltered, both from the psychological and social points of view, a world in a nutshell. The lone novice was of peasant stock, but she had for her formator the grandniece of the great aristocrat Jean-Baptiste Colbert. The pretty and young assistant infirmarian laughed at the whims of the beloved old sister philosopher. The well-balanced prioress had for her assistant a nun passionately in love with the divine office. The Constituent Assembly provisionally suspended the profession of vows in all monasteries on 29 October 1789. Mother Thérèse was distressed that the decree prevented Sr. Constance, the lone novice, from making her profession. She wrote to a former postulant: Sr. Constance remains always a novice here. Troubles have not been lacking on the side of her family: now they do not want her letters anymore or to hear her spoken of. The Lord permits this to be assured of her fidelity, and she accounts herself happy if they leave her in peace as at present. She hopes that the good God will at last touch their hearts and that they will look on her perseverance without sorrow. In February of the following year, the nuns were ordered to elect, in the presence of the municipal officers, a prioress and a bursar. Mo. Thérèse was unanimously re-elected; Mo. Henriette was voted bursar. The state then provided the eighteen intern nuns with decent pensions. Another provision of the Civil Constitution of the Clergy required priests and religious to take a loyalty oath that required them to be faithful to the nation, the law and the king; and to maintain the constitution with all their power. What the ambiguous statement meant was that they were to give the revolutionary government the right to control and democratize the Church in complete disregard of Papal jurisdiction. Pope Pius VI issued on 10 March 1791 a condemnation of the Civil Constitution of the Clergy and forbade the clergy to take it. A schism was inevitable. The clergy was split between the juring (those who took the oath) and non-juring bishops and priests. Two weeks after Easter of 1792, the guillotine was installed in Paris. Everyone was talking about it, even in the Carmel of Compiègne, and everyone feared it. In September, around 1,400 enemies of the Republic were killed during the infamous September Massacre; among them were hundreds of non-juring priests. A belief that they would all be called to martyrdom someday prevailed in the community. Between June and September of that year, Mo. Thérèse proposed that the community offer their lives to God with an act of oblation in order that the divine peace which Christ has brought to the world may be restored to the Church and to the State. All promised to unite themselves to it, except for Sr. of Jesus Crucified and Sr. Charlotte of the Resurrection, the two most senior nuns. Trembling and fearful that they would end more than fifty years of peaceful life in Carmel with a bloody death, both withdrew from the community. Before the day ended, however, they prostrated themselves before the prioress and tearfully asked forgiveness for their momentary weakness. All the nuns renewed the act until the very day of their death. On 14 August 1792, the Convention ordered all French citizens receiving state pension to take the Oath of Liberté-Egalité which required them to be faithful to the nation and to maintain liberty and equality or to die defending them. Three days later, all religious houses were ordered vacated. At this point in time, the Carmelites of Compiègne had been reduced to nineteen with the death of two sisters. The remaining nuns left the monastery and garbed secular clothes on 14 September 1792. They divided themselves into four groups with the prioress, sub-prioress, bursar and another nun heading each. On 19 September, with the permission of Fr. Rigaud, their ecclesiastical superior, they all took the Oath of Liberté-Egalité. Thus, all, including the tourières, were eligible to receive pension from the state. Only Sr. Constance, the novice, was excluded from this right because the members of the Directory of Compiègne did not consider her a full religious. For two years, each community strove to continue being faithful to their regular observances. The beautiful accord which reigned among all the sisters ensured that each one never deviated from her duties. One could say that obedience was practiced with all the exactitude of the cloister. It was difficult to find a priest to celebrate the Eucharist; nonetheless, the sisters faithfully recited the divine office at the appointed hours. Since their houses were not far apart, they managed to be in frequent contact with one another. Secretly, they sustained the members of the Confraternity of the Scapular and continued its enrollment. The extern sisters continued to buy provisions and to share these out among the different houses. The dynamism of the entire community was sustained by the daily renewal of the act of oblation and the solicitude of Mo. Thérèse. Situations worsened when Maximilien Robespierre and his henchmen, the radical and fanatical Jacobins, came into power during the summer of 1793. The Committee of Public Safety was established to protect the republic from foreign invasions and to control prices and wages all over the country. Along with this was institutionalized the infamous Reign of Terror. It not only apprehended and punished with death those who refused to be conscripted into the army but also anyone suspected of any unpatriotic behavior  or thoughts! Within its brief one-year and one-month existence, over 300,000 were imprisoned of whom 50,000 were executed by musketry or in the dreaded guillotine or died in prison. France was literally transformed into an abattoir for her own people. Obsession replaced reality as the radical leaders sought to establish a utopistic society. Anticlericalism reached its apex and, later, the revolution began to take the guise of a religion. First there was the abolition of the Gregorian calendar. Then churches were turned into Temples of Reason. Next, the juring clergy were ordered to marry (about 20,000 heeded). Finally, Robespierre established the Cult of the Supreme Being in an attempt to totally de-christianize France. On the evening of 21 June, Mother Thérèse promptly returned by stagecoach to Compiègne.She was met by some of the nuns who informed her that members of the Committee for Revolutionary Surveillance had searched all their four abodes that very morning and seized all their papers.The search continued the following day. A portrait of the guillotined king, a copy of his will, letters from their deported non-juring confessor and scapulars of the Sacred Heart were found and branded seditious.They also took the food prepared for the nuns, depriving them of nourishment that day. As previously mentioned, nineteen of the Carmelites of Compiègne were still alive by the middle of 1792.During the time of the arrest, Sr. Marie of the Incarnation was still in Paris. Since March 1794, Sr. Thérèse of Jesus and Sr. Stanislas of Providence were in Rosières.Thus only sixteen were arrested. Through the biography written by Sr. Marie, we were not only able to know much about the arrest and execution of her community (in this entire chapter, unless noted otherwise, her accounts are enclosed in quotations)but also about their lives. Mother Thérèse of St. Augustine (Marie-Madeleine-Claudine Lidoine; b. 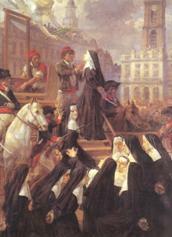 22 September 1752 in Paris), a woman so loved by God, was serving her second term as prioress when the Revolution struck. Her correspondences reveal a woman of great human and supernatural qualities. Sr. Charlotte of the Resurrection (Anne-Marie-Madeleine Thouret;b. 16 September 1715 in Mouy, Oise), the most senior member of the community, possessed a lively temperament. Fond of frequenting balls in her youth, she entered Carmel after a tragic event.She served as infirmarian to the point of developing a spinal column deformation that she endured until death. Sr. Euphrasie of the Immaculate Conception (Marie-Claude-Cyprienne Brard; b. 12 May 1736 in Bourth, Eure),the philosopher and joie de vivre of the recreation,admitted that she was filled for some time with resentment against her prioress. She worked very hard on herself that in the end she was able to overcome her negative disposition. The two tourières were blood sisters. Anne-Catherine Soiron (b. 02 February 1742 in Compiègne)tearfully begged the prioress not to let her and her sister be separated from the community during those crucial hours. Thérèse Soiron,(b. 23 January 1748 in Compiègne) possessed such a rare beauty and charming personality that the ill-fated Princess de Lamballe wanted her to be attached to her court. She responded: Madame, even if your Highness would offer me the crown of France, I would prefer to remain in this house, where the good God placed me and where I found the means of salvation which I would not find in the house of your Highness. On 23 June, the sixteen nuns were forcibly reunited in the Maison de Reclusion, a former monastery of the Visitation Nuns. In the room next to theirs were imprisoned a group of English Benedictine Nuns from Cambrai. The following day, the Carmelites retracted before the town mayor the Oath of Liberté-Égalité they had made  thus signing their own death warrant. Meanwhile, their captors waited for instructions from the Committee for Public Safety in Paris. The three-week imprisonment was very harsh. The food was hardly palatable and the sick were not given any special diet. A few straws on the bare floor served as their beds. The two communities of nuns were forbidden to communicate with each other, yet the abbess of the Benedictines, Mother Mary Blyde, somehow was able to converse with the Carmelites on two occasions. Fresh clothing was denied the nuns, yet they were forbidden to wash their soiled clothes. After many solicitations, they were finally granted a particular day to do their washing - but they never even had the chance to finish their laundry. At 10:00 a.m. of 12 July, members of the Revolutionary Committee of Compiègne came with orders from Paris to transfer the Carmelites to the dreaded Conciergerie at the capital. Mother Thérèse protested the untimely order.Their civilian clothes had just been put to soak. She requested permission to seek fresh clothing for her sisters to bring along. This was straightforwardly refused. Therefore, the nuns had to go to Paris wearing part of what was once their religious habits, the only dry clothing that was available. After finishing their meager repast, the sixteen bade adieu to their Benedictine companions. With hands bound behind their back, they were herded into two carts for the long journey to Paris. Along with them was arrested a citizen named Mulot de la Ménardière, accused as an accomplice of the nuns. A great number of women, many of whom the nuns helped in many ways, sneered at them: They do well to destroy them. They are useless mouths. Bravo! Bravo! Mother Thérèse meanwhile calmed Catherine Soiron who was outraged by the way they were being maltreated. While waiting for their trial, the nuns occupied themselves with prayers and works of charity. They sought the sick among the imprisoned and attended to them even until late in the night. During daylight, they continued to celebrate the divine office faithfully. The other prisoners woke in the middle of the night hearing the nuns chanting Matins. Sr. Julie-Louise celebrated the feast of Our Lady of Mount Carmel (16 July) by composing a canticle to the tune of the Marsellaise. Mother Thérèse continually supported the sisters with her exemplary courage, calmness, and maternal attention to the needs of their distressed bodies.
. They are more than a band, an assembly of rebels, with criminal hope of seeing the French people returned to the chains of tyrants and to the slavery of bloodthirsty priests who are impostors as well. They are your accomplices! was the blunt reply of the presiding judge. In the end, the sixteen were convicted as enemies of the people. A sentence was given: death by guillotine. The nuns received their penalty with serenity and joy. However, Thérèse Soiron fainted. Tension, fatigue, and lack of sleep and nourishment finally broke her down. The prioress quickly asked a constable for a glass of water for the tourière. When she regained consciousness, Thérèse asked pardon for her weakness and assured them she was ready to be faithful to the end. After that incident, it became quite clear that the nuns needed something to eat. After all, they had not eaten anything since the break of dawn. With the permission of the prioress, Mother St. Louis bartered a pelisse in exchange for sixteen cups of chocolate. Thus, while the executioner carried out on the other condemned prisoners the last toilet  the trimming away of hair and ripping of any clothing that may impede the decapitation of their heads  the nuns had the opportunity to dine in common before their execution. The guillotine had been standing for more than a month already at the Barrière du Trône. Upon arriving there, Sr. Constance suddenly accused herself before Mother Thérèse of not having finished her divine office.ioress, told her: Be strong, daughter.You will finish it in Paradise! Twenty-four others were executed that day but we do not know any detail concerning them. Summoned by her real name, Sr. Constance knelt before Mother Thérèse and asked for her blessing and the permission to die. This being given, the novice kissed a small red-clay statuette of the Virgin and Child that Mother Thérèse had been concealing in her hand. but silence. On that day, it was said, more than one religious vocation was born and just as many conversions took place. Ten days later, amidst cacophonous shouts and screams, an infuriated and disillusioned crowd led a man to his death on the guillotine. Down with the tyrant! they cried. This time, it was the turn of Maximilien Robespierre. More than a week later, an enervated Antoine Fouquier-Tinville followed his fate on the very instrument where he had sent hundreds to their death. And with the inglorious end of these two died, also, the Reign of Terror. THE DECREE ON THE MARTYRDOM OF MARIE-MADELEINE-CLAUDINE LIDOINE (THÉRÈSE OF ST. AUGUSTINE) AND HER SIXTEEN COMPANION MARTYRS WAS PROMULGATED ON 24 JUNE 1905. THEY WERE BEATIFIED ON 17 MAY 1906. © Copyright 1998-2014 Help Fellowship, Inc.